I live in a coastal area about 200 feet from a river fed by salted coastal water. Have seawater seeping into my well water since drilling was done to install geothermal closed loop system. Drill holes are 300 feet deep x 3 for 6 ton heat pump. I do not have a recent water analysis at this time. What I can say is that we can drink the water but it has a slight salty taste to it. As for gallons per day, just 2 retired adults in household. No irrigation or gardening....mostly for inside the home. What can I do to purify my salty well water? For brackish waters like yours we recommend a reverse osmosis filtration system. Reverse osmosis works by passing water through a semi-permeable membrane that separates pure water into one stream, and salt water into another. In regular osmosis, water flows from a solution with lower salt concentration to a solution with higher salt concentration. In reverse osmosis, the application of pressure greater than the osmotic pressure reverses the water flow, causing it to move from a high concentration solution to the lower concentration solution, and producing pure water. 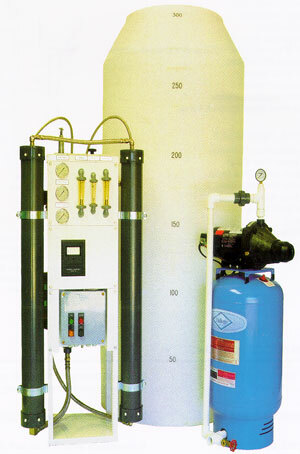 An RO system will remove sodium and other contaminants often referred to collectively as TDS, or total dissolved solids. These include salts, metals, fluoride, chloride, arsenic, and other inorganic material. 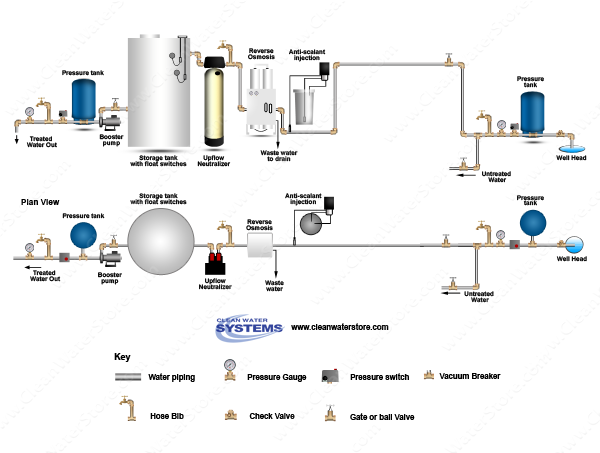 For your application we recommend an EPRO-1500 XP commercial RO system with storage tank, booster pump, and float switches. The EPRO has a 220v plug similar to what an electric clothes dryer might have, and can be plugged into a 220v wall outlet. When the float switch in the 300 gallon tank drops down because water has been pumped out and used in the house, the system turns on and fills the storage tank back up. It's a good idea to install a metering pump before your RO system - we recommend a Stenner pump for reliability and ease of use - to protect your EPRO's membrane from natural minerals in your water by injecting a tiny amount of food-grade, NSF-certified anti-scalant called “Pre-Treat+ NSF.” Pre-treating your water this way will increase the lifespan of your RO membrane to about 6-8 years. The EPRO system also includes a 5 micron pre-filter that will filter out tiny contaminants down to a size of 5 microns, further preserving the integrity of your RO membrane. Since the RO will filter hardness minerals like calcium, we also recommend installing a calcite upflow neutralizer after the EPRO to add a little hardness back into your water and neutralize its pH level. With these systems you'll see that brackish water turn into tasty, salt-free water in no time. If you need any further assistance selecting or installing treatment systems, or if you have pictures or a testimonial you'd like to share, don't hesitate to write to us at support@cleanwaterstore.com, on Facebook, or on our website. Thanks for the letter, John!